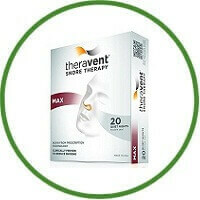 Theravent MAX is a powerful option for heavy snorers to effectively reduce their snoring problem, and deliver a quiet night of sleep back to their bed partner. MAX is made for loud and heavy snorers, it has double the snoring reduction strength of REGULAR, it’s comfortable, easy-to-use, and works immediately to significantly reduce snoring. MAX showed a 73% reduction in snoring vs. a 22% reduction by nasal strips (nasal strips like Breathe Right) and 89% of bed partners reported that MAX reduced their partners’ loud snoring significantly. A 30-night packs of disposable Theravent Max snoring reduction devices, a full month’s supply to ensure a snore free night when it matters most. It is an easy way to significantly reduce snoring, no machines, no drugs, no mouthpieces, no sprays (30-day money back guarantee).